Over the past six years, our team at Fractl has studied the art of mastering content marketing press coverage. Before moving into Agency Operations, I on-boarded and trained over a dozen new associates for our digital PR team within a year as the Media Relations Manager. Scaling a team of that size in a such a short period of time required hands-on training and a clear communication of goals and expectations within the role — but what metrics are indicative of success in digital PR? 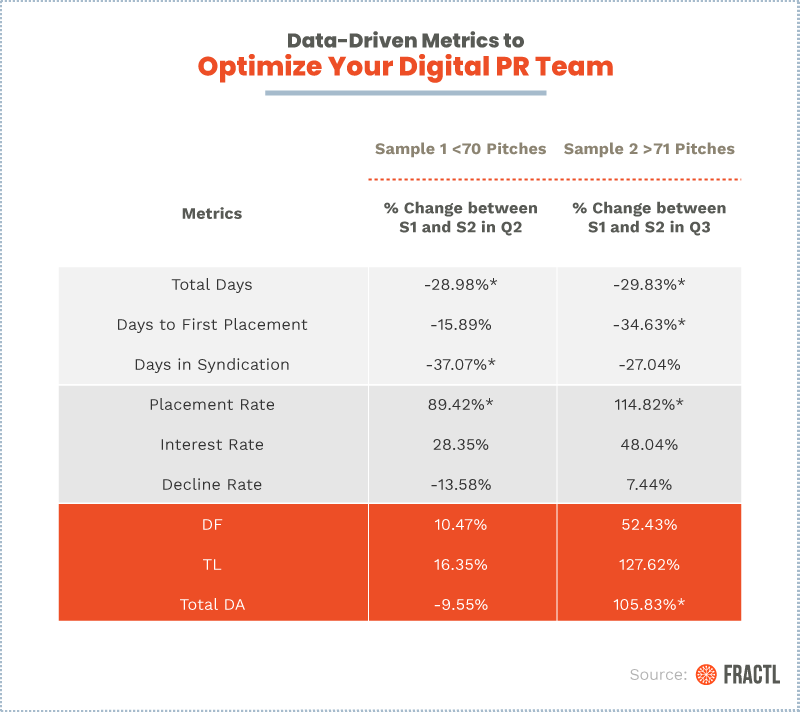 As a data-driven content marketing agency, we turned to the numbers for something a little different than our usual data-heavy campaigns — we used our own historical data to analyze and optimize our digital PR team’s outreach. This post aims to provide better insight in defining measurable variables as key performance indicators, or KPIs, for digital PR teams and understanding the implications and relationships of those KPIs. We’ll also go into the rationale for establishing baselines for these KPIs, which indicate the quality, efficiency, and efficacy of a team’s outreach efforts. As a guide for defining success by analyzing your own metrics for your team (digital PR or otherwise), we’ll provide the framework for the research design, which helped us establish a threshold for the single variable we identified to best measure our efforts and be the most significantly correlated with the KPIs indicative of success of a digital PR team. The influx of available data for marketers and PR professionals to measure the impact of their work allows us to stray away from vague metrics like “reach” and the even more vague goal of “more publicity.” Instead, we are able to focus on the metrics most indicative of what we’re actually trying to measure: the effect of digital PR efforts. We all have our theories and educated guesses about which metrics are most important and how each are related, but without researching further, theories remain theories (or expert opinions, at best). Operational research allows businesses to use the scientific method as a way to provide managers and their teams with a quantitative basis for decision making. Operationalization is the process of strictly defining variables to turn nebulous concepts (in this case, the effort and success of your digital PR team) into variables that can be measured, empirically and quantitatively. There is one indicator identified to best measure your effort into a campaign’s outreach. It is a precursor to all of the indicators below: the volume of pitch emails sent for each campaign. Because all pitches are not created equal, the indicators below gauge which factors best define the success of outreach, such as the quality of outreach correspondence, the efficiency of time to secure press, the efficacy of the campaign, and media mentions secured. Each multi-faceted metric can be described by a variety of measurements, and all are encompassed by the independent variable of the volume of pitch emails sent for each campaign. Placement Rate: The percentage of placements (i.e., media mentions) secured per the number of total pitches sent. Interest Rate: The percentage of interested publisher replies to pitches per the number of total pitches sent. Decline Rate: The percentage of declining publisher replies to pitches per the number of total pitches sent. Total days of outreach: The number of business days between the first and last pitch sent for a campaign, which is the sum of the two metrics below. Days to first placement: The number of business days between the first pitch sent and first placement to be published for a campaign. Days to syndication: The number of business days between the first placement to be published and the last pitch to be sent for a campaign. Total Links: The total number of backlinks from external linking domains of any attribution type (e.g. DoFollow, NoFollow) for a campaign’s landing page. Total DoFollow Links: The total number of DoFollow backlinks from external linking domains for a campaign’s landing page. Total Domain Authority of Links: The total domain authority of all backlinks from external linking domains of any attribution type (e.g. DoFollow, NoFollow,) for a campaign’s landing page. After identifying the metrics, we need to solve the next challenge: What are the relationships between your efforts and your KPIs? The practical application of these answers can help you establish a threshold or range for the input metric that is correlated with the highest KPIs. We’ll discuss that in a bit. After identifying metrics to analyze, define the nature of their relationships to one another. Use a hypothesis test to verify an effect; in this case, we’re interested to find the relationship between pitch count and each of the metrics we defined above as being KPIs of successful outreach. This study hypothesizes that campaigns closed out in 70 pitches or less will have better KPIs than campaigns closed out with over 71 pitches. Next, determine if the relationship is significant; when the relationship is stated as statistically significant, the relationship observed has a high likelihood of happening in the future. When it comes to claiming statistical significance, some may assume there must be a complex formula that only seasoned statisticians can calculate. In reality, determining statistical significance is done via a t-test, a simple statistical test that compares two samples to help us infer a correlation of the same relationships in future samples. In this case, campaigns with pitch counts below 70 are one group and campaigns above 71 are a second group. The findings below define the percentage difference between the means of both groups (i.e., the campaigns from Q2 and Q3) to determine if lower pitch counts do have a desired effect for each metric; those that are asterisked are statistically significant, meaning there is a less than a 5 percent chance that the observed results are due to chance. In practice, the relationships between these metrics help you establish a better standard of practice for your team’s outreach with realistic expectations and goals. Further, the correlation between the specified range of pitch counts and all other KPIs give you a reliable range of what values you can expect when it comes to the metrics for pitch quality, timelines, and campaign performance when adhering to the range of pitches. The original theory — that a threshold for pitch counts exists when the relationship between pitch count and all other metrics of performance were compared — is confirmed by the data. The sample with lower pitch counts (less than 70) sees a positive relationship with the KPIs we want to decrease (e.g. decline rates, total days) and negative relationship with the KPIs we want to increase (e.g. placement rates, link counts). The sample with higher pitch counts (greater than 71) saw the inverse — a negative relationship with the KPIs we want to decrease and a positive relationship with the KPIs we want to increase. Essentially, when campaigns with less than 70 pitches sent were isolated, the numbers improved in nearly every metric. When this analysis is applied to each of the 74 campaigns from Q3, you’ll see nearly consistent results, with the exception again being Total Domain Authority. Campaigns with up to 70 pitches are correlated with better KPIs when compared to campaigns with over 71 pitches. Vague or unrealistic expectations and goals will sabotage the success of any team and any project. When it comes to the effort put into each campaign, having objective, optimized procedures allows your team to work smarter, not harder. So, what does that baseline range look like, and how do you calculate it? A simple question helps answer what the baseline should be in this instance: What was the average of each KPI of the campaigns with fewer than 70 pitches? We gathered all 70 campaigns closed out of our digital PR team’s pipelines in the second and third quarters of 2018 with pitch counts below 70 and determined the average of each metric. Then, we calculated the standard deviation from the mean, which defines the spread of the data to establish a range for each KPI — and that became our baseline range. Examining historical data is among the best methods for determining realistic baselines. By gathering a broad, sizeable sample (usually more than 30 is ideal) that represents the full scope of projects your team works on, you can determine the average for each metric and deviation from the average to establish a range. 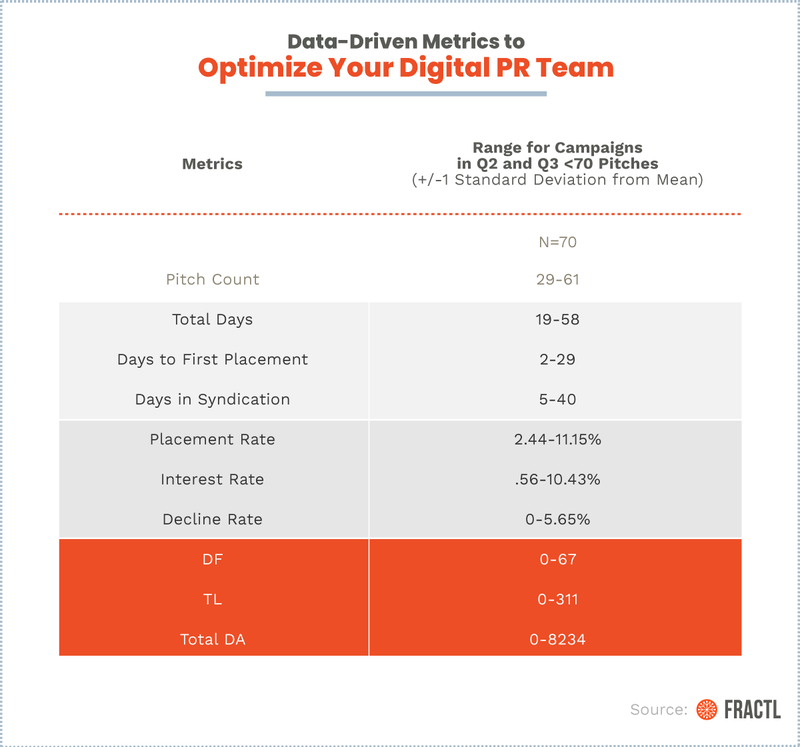 These reliable ranges allow your digital PR team to understand the baselines they must strive for during active outreach when in compliance with the standard of practice for pitch counts established from our research. Further, these baseline ranges allow you to set more realistic goals for future performance by increasing each range by a realistic percentage. Deviations from that range act as indicators of potential issues related to the quality, efficiency, or efficacy of their outreach, with each of the metrics implying what specifically may be array. We offer context into each of those metrics defining our three KPIs in terms of their implications and limitations. The purpose of a pitch is to tell a compelling and succinct story of why the campaign you’re pitching is newsworthy and fits the beat of the individual writer you’re pitching. Help your team succeed by enforcing tried and true best practices to enable them to craft each pitch with personalization and compelling narratives at the top of mind. The placements act as a conversion rate to measure the efficacy of your team’s outreach while interests and declines act as a combined response rate to measure the quality of outreach. To help your team avoid the “spray and pray” mentality of blasting out as many pitches as possible and hoping one will yield a media mention, which ultimately jeopardizes publisher relationships and are an inefficient use of time, focus on the rates our teams secure responses and placements from publishers in relation to the total volume of pitches sent. Prioritize this interpretation of the data rather than just the individual counts to help add context to the pitch count. Campaigns with a high-ratio of interest and placements to pitches from publishers imply the quality of the pitch was sufficient, meaning it encompassed one or more of the factors known to be important in securing press coverage. This includes, but is not limited to, compelling and newsworthy narratives, personalized details, and/or relevancy to the writer. In some cases, campaigns may have a low-ratio of interest but high-ratio of placements as a result of a nonresponse bias — the occurrence where publishers will not respond to a pitch but will still cover the campaign in a future article, yielding a placement. These “ghost posts” can skew interest rates, illustrating why three metrics compose this KPI. Campaigns with a high-ratio of declines to pitches imply the quality of the pitch may be subpar, which signals to the associate to re-evaluate their outreach strategy. Again, the inverse may not always be true, as campaigns with a low ratio of declines may be a result of non-response bias. In this case, if publishers do not respond at all, we can either infer they did not open the email or they opened the email and were not interested, therefore declining by default. While confounding variables (such as the quality of the content itself, not just the quality of the pitch) may skew these metrics in either direction and remain the greatest limitation, holistically, these three metrics offer actionable insights during active outreach. Similarly, ranges for timeline metrics can give your associates context of when they should be achieving milestones (i.e., the first placement) as well as the total length of outreach. Deviating beyond the standard timeline to secure the first placement often indicates the outreach strategy needs re-evaluating, while extending beyond the range for total days of outreach indicates a campaign should be closed out soon. Efficiency metrics help beyond advising the strategy for outreach, informing operations from a capacity standpoint. Toggling between tens and sometimes hundreds of active campaigns at any given point relies on consistency for capacity — reducing variance between the volume of campaigns entering production to campaigns being closed out of the pipeline by staggering campaigns based on their average duration. This allows for more robust planning and reliable forecasting. Awareness of the baselines for time to secure press enables you and your team to not just plan strategies and capacities, but also the content of your campaigns. You can ensure timely content by allowing for sufficient time for outreach when ideating your campaigns so the content does not become stale or outdated. The biggest limitation of these metrics is a looming external variable often beyond our control — the editorial calendars and agendas of the publishers. Publishers have their own deadlines and priorities to fill, so we can not always plan for delays in publishing dates or worse yet, scrapping coverage altogether. Ultimately, your efforts are intended to yield placements to gain brand awareness and voice, as well as build a diverse link portfolio; the latter is arguably easier to quantify. Total external links pointing to the campaign’s landing page or client homepage along with the total Domain Authority of those links allow you to track both the quantity and quality of links. Higher link counts built from your placements allow you to infer the syndication networks of the placements your outreach secured, while higher total Domain Authority measures the relative value of those linking domains to measure quality. Along with further specifying the types of links (specifically Dofollow links, arguably the most valuable link type), these metrics have the potential to forecast the impact of the campaign on the website’s own overall authority. Often times, historical research designs such as this one can have limitations in their cause and effect implications. This collection of data offers valuable insight into correlations to help us infer patterns and trends. Our analysis utilized historical data representative of our entire agency in terms of scope of clients, campaign types, and associates, strengthening internal validity. So while the specific baseline metrics are tailored to our team, the framework we offer for establishing those baselines is transferable to any team. Track the ten metrics that compose the KPIs of digital PR outreach for each campaign or initiative to keep a running historical record. Determine the average spread via the mean and standard deviation for each metric from a sizeable, representative sample of campaigns to establish your team’s baseline metrics. Test any theories of trends in your team’s effort (i.e., pitch counts) in relation to KPIs with a simple hypothesis test to optimize your team and resources. How does your team approach defining the most important metrics and establishing baseline ranges? How do you approach optimizing those efforts to yield the best press coverage? Uncovering these answers will help your team synergize more effectively and establish productive foundations for future outreach efforts.